Of the first three Horsemen, Pestilence was the least impulsive. When tensions mounted between War and Famine, leading to blows, Pestilence was instructed by Apocalypse to sort the two of them out. She did so coldly by making her teammates ill. They were soon given their first orders by Apocalypse – to defeat X-Factor. Riding upon flying, robotic steeds, Pestilence made her debut alongside War and Famine, confronting Iceman and the Beast. Cyclops and Jean Grey soon joined the battle, but even outnumbered Pestilence proved herself when she touched the Beast, making him gravely sick. In launching their assault on humanity in Manhattan, Pestilence passed through Hell's Kitchen, leaving chaos and disease in her wake. [Daredevil (1st series) #252] When she attacked an entire subway car full of commuters, Pestilence found surprising resistance in the form of the child heroes known as Power Pack, who had become aware of the Horsemen’s attack in New York and sought to help. The youngest of the group, Katie Power a.k.a. Starstreak, was in particular worried as their mother was supposed to be in the subway returning home and did her best to vex the far more powerful Horseman. 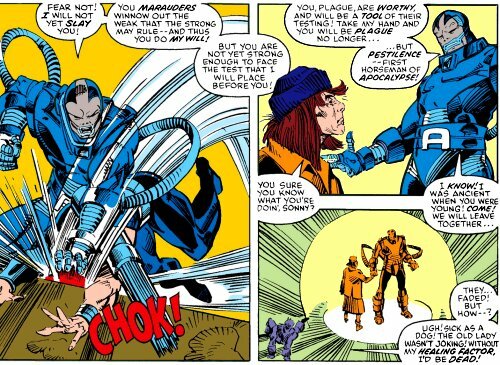 Ironically, Pestilence was mourned more by young Katie Power, who blamed herself for not being able to save her, than her master, Apocalypse. 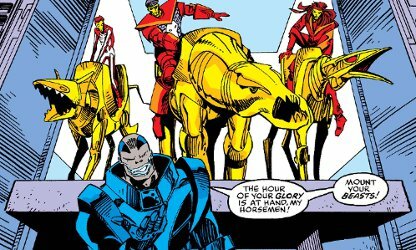 When X-Factor eventually confronted Apocalypse in his ship, the mastermind seemed not to care that his Horseman had been killed. She had been but a tool in his goal of testing the strong and winnowing the weak. In the years since Pestilence’s death, others have assumed her role, but none have had reason to remember the first who held the mantle. Whatever life the first Pestilence lived prior to her life as a Morlock or as a Horseman has been forgotten and remains lost to time.